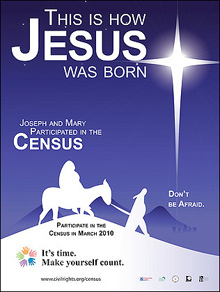 I thought I was the only one bemused by the Census 2010 ad campaign. There’s been a constant bombardment of ads of all types reminding me that in a few weeks I’ll be getting a big piece of paper in the mail from the US Census Bureau, and that they want all my identifying information. They remind me how important it is for funding purposes, because apparently all life is about fighting for free money from the federal government. I’m getting fed up, and apparently I’m not the only one. Here’s five of the most annoying aspects about the Census. The thing that bothers me the most isn’t even on the list. I’m most annoyed by the (over) $130 million dollars spent on an ad campaign that, to me, is vaguely racist. In the ad I see most often, a racially-and-ethnically-mixed group of men and women appear on a screen, talking about how they’re from the Census bureau and how important the Census is and blah blah blah. Long story short, there’s not a single white person in the ad. Last time I checked, white people made up the majority of the US population, and you can’t sneak a single cracker into your commercial? I looked for the ad at the Census’s YouTube channel, but can’t find it. It’s the one they’ve been playing constantly at the movie theater talking about Census workers and how they either A) need more of them or B) aren’t coming to kill you.